Coco Plum Cottage on the Water. Walk to town. Newly renovated. 2 Bedrooms, 1 full bath. Your own dock on the bay. Walk to the Perfect Cup Cafe, restaurants, art galleries and shops. We completely renovated and re furnished this cottage in 2011 for our own use a few weeks a year. The rest of the time we share it with others. For us, it is paradise. Matlacha [MAT' LA SHAY' ] is an old fishing village protected from high rises and modern desecration by historic district zoning. We are told that somewhere in this listing it says "no pets." That is not correct, your dog is allowed. We just can't find that statement to remove it! This property is owned by Matlacha Properties LLC. Your hosts and Andrew Peck and Chloe Dresser. As of 2012 We now have for our guests 2 kayaks, a single and a double, and we have 2 bicycles. We have wifi. The password is written on the modem. We do not do television, so there is not cable. There is a TV with DVD player and local library has many movies to choose from. We never thought we'd want a place in Florida until serendipitously, on a visit to Cayo Costa Island nearby, we happened upon the magical village of Matlacha. For us, it is the 'Woodstock of Florida.' [Woodstock, New York is one of our other homes]. A unique little village. Our cottage is in a neighborhood historic district, protected forever for the blight of high rises, condos, shopping malls and superhighways that have destroyed much of Florida and the rest of the USA. There are public tennis courts 3 miles from the cottage. Two person kayak, single person kayak, and 2 bikes. If bikes haven't been used for several weeks, there is an air pump in the tool closet to make sure the tires are fully inflated. We thoroughly enjoyed the location with direct access to the water. The cottage provides everything you need for an enjoyable vacation. It is located in a quiet area but within walking distance to restaurants and shops. The views from the deck are delightful. What we enjoyed most of all was the fact that we could use the two kayaks at any time. We loved staying at the cottage on the water and plan to return someday. The cottage is in great shape and has a perfect spot on the water. We really enjoyed sitting on the back patio and relaxing. It is in a very central spot, making it very easy to stroll around Matlacha. We will be recommending the cottage to our friends! Thank you for taking the time to write a review of our retreat. We feel the same way about it. We give guests like you who have booked one of our retreats a 10% discount on future stays at any one of our seven retreats in Eastern North America. We first came across Matlacha (say Mat-lashay) a couple of years ago whilst staying at Cape Coral. We found it a cute quirky little place, brightly painted and home to artists and other free thinkers. This year a last minute change of holiday plans found us with the chance of visiting again and maybe, this time, staying a little while. A brief search on the interweb, a couple of calls to Chloe and a few days later found us pulling off Pine Island road and down a little lane to " ... Dock of The Bay". Oh heaven - a compact olde worlde shack right on the water. Simply but comfortably equipped & furnished. Two comfortable bedrooms and an open plan kitchen / living room. The only sound is the lapping of the water, the calls of the resident Ospreys, Egrets and Ibis, the splashing of the fish and the grumbling of distant thunder. A short walk takes you to the main road and a selection of bars and eateries including our favourites - Pizza Bella, where they make the pizza bases fresh while you wait and The Olde Fish House Marina where you mix with leather tanned fishermen as you eat fresh caught fish, drink beer kept in a huge ice bucket and listen to live music in a open sided bar right on the water. Matlacha is a fisherman's paradise. 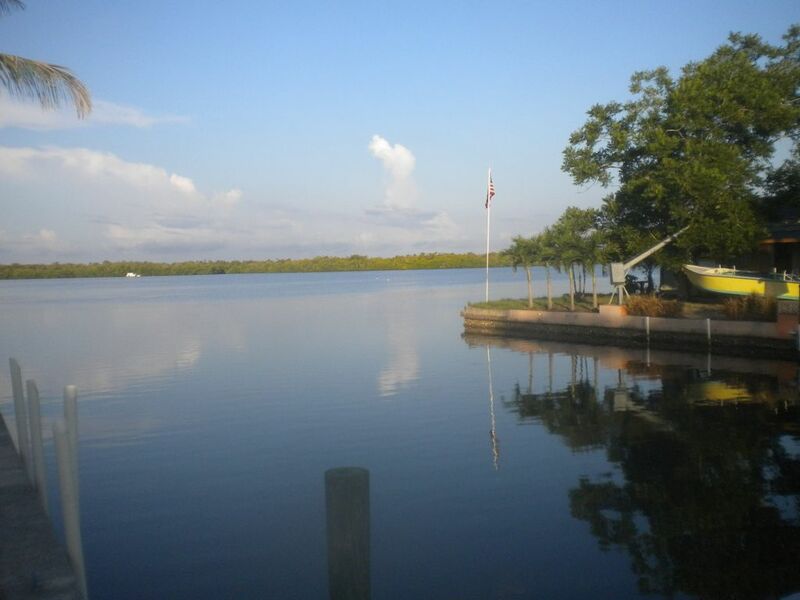 Fish for catfish & bass from your own dock, from "The Fishingest Bridge in Florida" (soon to be The Fishingest Reef), fish for ladyfish and sharks!! from Bokleia pier or dig deep into the walet for a private hire boat and skipper to fish for Tarpon. While you're there - try a tropical tipple at The Lowkey Tiki in St James city, a meal in luxurious surroundings at Tarpon Lodge or fresh, home made, value for money food at The Captain's Restaurant at Bokleia. Best though, for me at least, would be a steak (from Publix - 5 minutes down the road), a cold Bud and to watch the Sun go down from "Sitting on The Dock of The Bay". Mat-lashay - I want to go back there so much it hurts. Discounts: Rates listed are discounted 10% from June through Sept. If cancelled 45 days or more days prior to arrival, we refund rent received for the cancelled period less $100. service fee. If cancelled less than 45 days prior to your arrival, we will relist and make diligent efforts to re-rent it, if we rent it, we refund rent as above. If re-rented for part, of the period, refunded prorata.